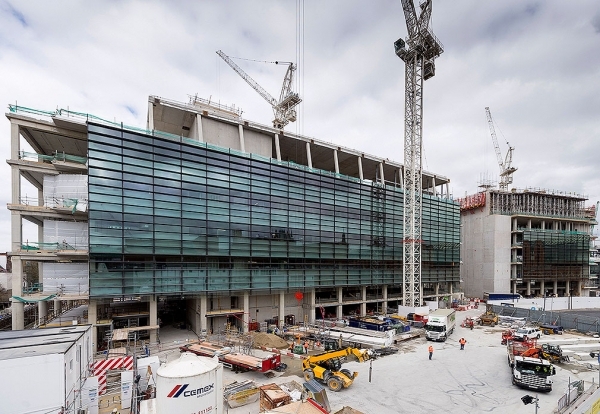 A construction worker has been killed at Laing O’Rourke’s £650m Francis Crick Institute site in King’s Cross. Richard Laco, 31, is believed to have been crushed by a concrete stairwell being lifted into place on the medical research centre job. Emergency services pronounced him dead at the scene on Wednesday afternoon. The site was closed down immediately after the incident and will remain shut until Monday. It has also emerged that Laco from Hendon had previously worked as a City trader but turned to construction for work after losing his job in the financial crash. An O’Rourke spokesman told the Enquirer: “We can confirm that at approximately 5pm on Wednesday 6 November, an incident occurred at the construction site of the Francis Crick Institute in London, in which a subcontractor’s construction worker suffered fatal injuries. “The thoughts of Laing O’Rourke and the entire Francis Crick Institute project team are with the family and colleagues of the deceased at this time. O’Rourke was appointed as main contractor on the four-year build programme in 2011 and a topping-out was held in July. The Unite union is calling on O’Rourke to lift a ban on its officials at the site in the wake of the tragedy. Unite assistant general secretary, Gail Cartmail said: “This fatality is a tragedy and our condolences go out to the bereaved family and friends. “This is a harsh reminder of the importance of high standards of health & safety in an industry that is extremely dangerous. “Trade unions have a role to play in maintaining safe working environments but Laing O’Rourke has bizarrely banned Unite officials from their sites. “There is no place for anti-trade union behaviour in an industry where we should be working together in the interests of safety.